The Fine Comfort-Ride sedan can accommodate six people and seats can be rearranged so that they all face inward. TOKYO -- Toyota Motor will expand its hydrogen fuel cell reach with a city bus it aims to commercialize next year and a roomy concept that fits somewhere between a crossover, minivan and rolling recreation room. The automaker outlined both fuel cell vehicles in a Wednesday preview of its Tokyo auto show plans. Media days for the show begin Oct. 25. The passenger concept, dubbed Fine-Comfort Ride, evokes the styling of a boxy stretch version of the Toyota C-HR subcompact crossover, with chiseled creases and a pinched rear. But the interior is way more spacious, seating six in palatial luxury -- as the name suggests -- with four chairs that swivel for a lounge layout, possibly hinting at autonomous driving capabilities. The windows double as video touch screens. 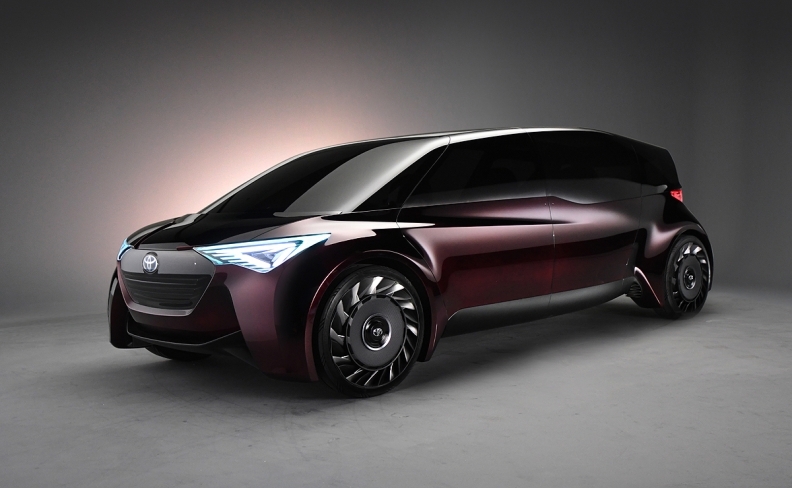 Toyota is pitching the Fine-Comfort Ride as a showcase of a fuel cell vehicle’s potential. For starters, electrified drivetrains open new design possibilities, allowing the cavernous interior. In the Fine-Comfort Ride, in-wheel motors save space under the hood. But unlike battery-powered electric vehicles, hydrogen-powered ones get longer range. Toyota envisions its concept cruising up to 1,000-km (620 miles) when fully topped off. 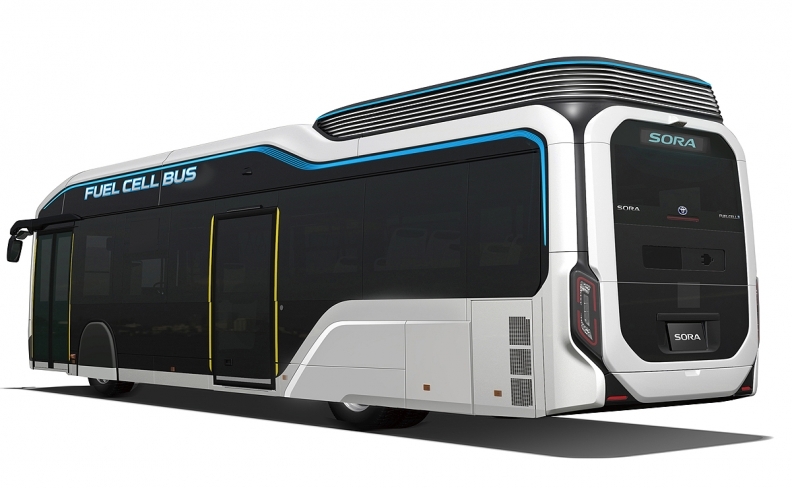 The other hydrogen-powered vehicle on show is roomier still -- a city bus concept called Sora. The Sora bus uses two fuel cell stacks, two electric motors, a nickel-metal hydride battery and 10 high-pressure hydrogen tanks. Toyota aims to put 100 of the buses on the streets of Tokyo and have them in service when the Japanese capital hosts the 2020 Summer Olympics. Sora takes its name from an acronym of the words sky, ocean, river and air, an allusion to the Earth’s water cycle. It uses two fuel cell stacks, two electric motors, a nickel-metal hydride battery and 10 high-pressure hydrogen tanks. Toyota also outfits it with several advanced technologies. The first is an array of eight cameras on the inside and outside to detect pedestrians and bicycles around the bus and warn the driver when one is in the way. Another is an acceleration-control function that glides the bus to smoother takeoffs. Finally, the Sora gets an automatic arrival-control function. This technology detects the lines on the road to help automatically steer and decelerate the bus to a precise clearance of 1.2 to 2.4 inches from the bus stop and no more than 4 inches before or after it. The goal is easier boarding for passengers with disabilities or those with strollers. Toyota is aggressive in positioning hydrogen fuel cells as one of its long-term drivetrain technologies. In December 2014, it began selling the Mirai fuel cell sedan. Since then, it has sold about 4,000 Mirais globally, about half in the U.S. This year, Toyota delivered two 77-seat fuel cell buses, which are already operating in Tokyo. The buses show how Toyota aims to eke economies of scale wherever it can, by sharing components already developed for the four-seat Mirai. And by logging long routes every day, buses are a key driver of demand for hydrogen. Boosting demand for the fuel is seen as key to propagating the refueling network. One bus, for example, uses as much hydrogen fuel in a year as 45 fuel cell cars such as the Mirai. Japan’s government also is backing hydrogen as a fuel of tomorrow and has a campaign to promote fuel cell vehicles. The plan calls for a cumulative 40,000 fuel cell vehicles in operation in Japan by 2020, then 200,000 by 2025 and a whopping 800,000 by 2030.